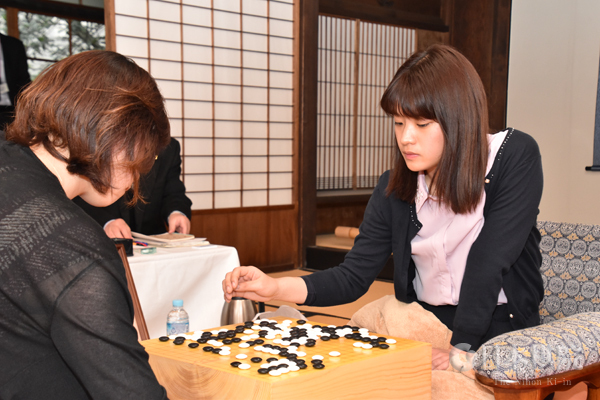 In recent years, the first game of the Women’s Meijin title match has been linked with the first Judan game, being held at the same venue, the Osaka University of Commerce, on the following day. 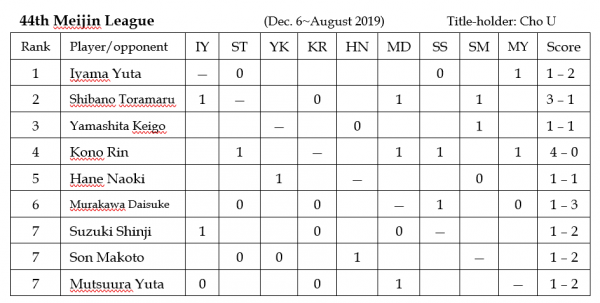 This year it featured yet another title-match clash, the eighth, between Fujisawa Rina, holder of three women’s titles, and Xie Yimin 6P, who has had no title to her name since she lost the Women’s Honinbo to Fujisawa last December. She has memories of this title, as she held it for nine years in a row, so she will be hoping to make a comeback. Fujisawa actually had the better start, but Xie caught up by living inside White’s sphere of influence, then took the lead by reducing White’s main territory. Fujisawa resigned after 241 moves. The second game was played in the Arisu Pavilion on the campus of Heian Jogakuin University (also known as St. Agnes’ University) on March 14. Fujisawa (black) beat Xie by resignation after 189 moves. Xie took the initiative in the opening, but Fujisawa made a successful attack in the middle game and drew level with her. At the end, Xie slipped up in time trouble, so Fujisawa took a big lead. Up to this loss, Xie had won nine games in a row. The third game will be played at the Nihon Ki-in on March 22. 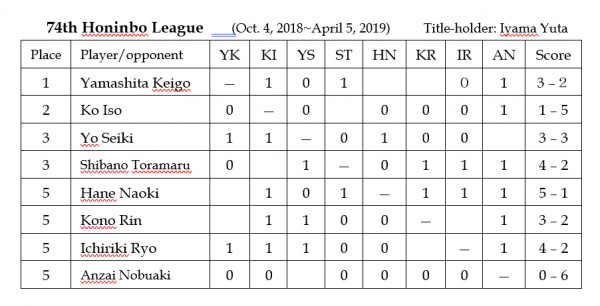 The final of the Professional Pair Go Championship 2019 was held at the Nihon Ki-in in Tokyo on March 3. Taking white, the pair of Fujisawa Rina and Ichiriki Ryo beat Osawa Narumi and Kyo Kagen by resignation. This is one of the closest leagues in memory, with six players still in contention after five rounds; after three games in the sixth round, that number has been reduced by only one. These days, according to a new rule, only the top two players in a multiple tie qualify for the play-off, but in an earlier decade there was a five-man play-off, so it was like a mini-tournament in its own right. With two wins since our last report, Hane Naoki 9P has improved his score to 5-1, giving him the sole lead. If he can beat Yamashita Keigo in the final round in April, he will be the challenger. Still in the running if he slips up are Shibano Toramaru 7P and Ichiriki Ryo, both on 4-2, and Yamashita and Kono Rin 9P, both on 3-2. 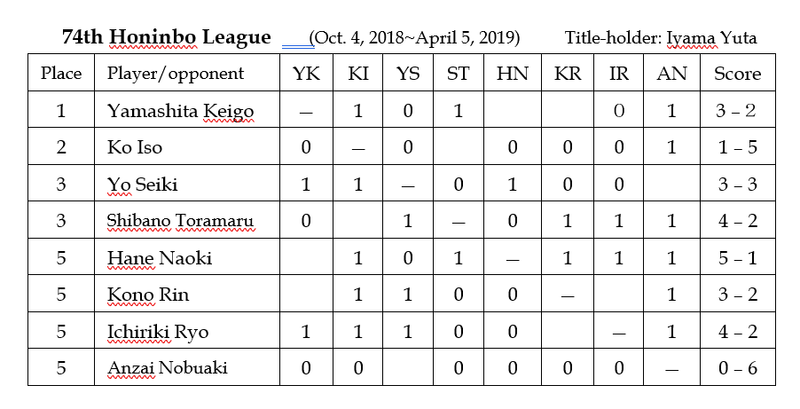 One of these four players, though, will lose his place in the league, joining Ko Iso and Anzai Nobuaki. Actually, at this point Hane is the only player immune from demotion. For the first time, all of the games in the final round will be held on the same day, April 5, at the Nihon Ki-in in Tokyo with a public commentary being held from 6 to 9 p.m. (to be extended if necessary). (Feb. 11) Kono Rin 9P (B) beat Yo Seiki 7P by resig. This was Yo’s second loss, so he fell behind Shibano and Kono (both on 3-1 at this point). (Feb. 21) Hane Naoki (B) beat Ko Iso 8P by resig. ; Yamashita Keigo 9P (W) beat Shibano Toramaru 7P by 3.5 points. (March 7) Ko Iso 8P (B) beat Anzai Nobuaki 7P by 3.5 points. (March 14) Hane (B) beat Ichiriki Ryo 8P by resig. ; Shibano Toramaru (B) beat Yo Seiki 8P by resig. 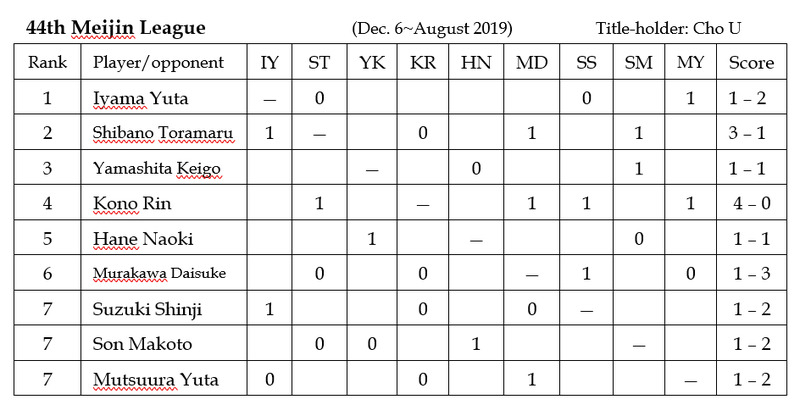 After three and a half rounds, Kono Rin, on 4-0, is the only undefeated player, so he has a theoretical chance of playing in two best-of-sevens this year. His March 14 win detailed below is also his 13thwin in a streak that began last December. The Go Weekly report on the league went off topic in an interesting aside. The reporter wrote that if you were to publish a new book on josekis, the star point would probably take over half the space, as recently star-point variations have evolved a lot and become remarkably complicated. A novel variation appeared in the Kono v. Murakawa game. (Feb. 21) Kono Rin 9P (B) beat Suzuki Shinji 7P by resig. ; Mutsuura Yuta 7P (W) beat Murakawa Daisuke by resig. At this point, Kono, on 3-0, was the sole undefeated player. (March 7) Shibano Toramaru 7P (W) beat Son Makoto 7P by resig. (March 14) Kono Rin (W) beat Murakawa Daisuke 8P by 2.5 points. Kusunoki Teruko 7P will retire as of March 31. Born on September 3, 1939, she became 1-dan in 1956 and reached 7-dan in 1984. She won the Women’s Honinbo three years in a row and five times overall and the Women’s Kakusei two years in a row. She is one of the three Honda sisters; her oldest sister, Sugiuchi Kazuko 8P, is still active at the age of 92. The second sister, Honda Sachiko 7P, aged 88, retired in 2000. Yoshida Harumi 1P will also retire at the end of this month. Born on November 28, 1957, she became a disciple of Iwamoto Kaoru 9P and became a professional in 1981.